"Red wine in a pill"-- will it slow aging? According to London's DAILY MAIL, the pharmaceutical firm GlaxoSmithKline is testing synthetic versions of resveratrol, which is found in red wine, and seems to have the effect of reversing the aging process, even serving as an anti-aging method. Back to the Mail: "The work proves that a single anti-ageing enzyme in the body can be targeted, with the potential to prevent age-related diseases and extend lifespans." Sounds great. But then some of the reader follow-ups raise another side: (a) what if a miracle drug--this or another--extends human life, but doesn't really help the ills of aging: creaky joints, wrinkled skin, memory and eye problems? And (b) where will the 150-year olds live, given the continuing influx of "young-uns." 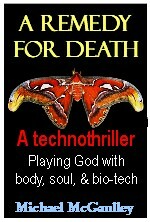 And a point I didn't see in those viewer comments but is raised in my technothriller A REMEDY FOR DEATH: Playing God with Body, Soul, and Bio-tech-- what if this breakthrough is reserved only for the elite? That is, the super-rich, powerful political types, and those who are willing to play along, follow the elites' orders, do whatever?